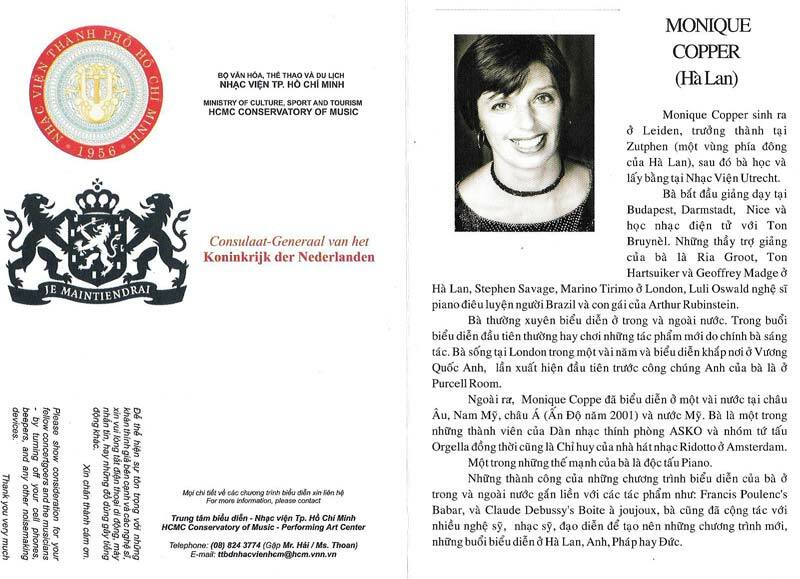 The Director of the Conservatory of Music writes to Monique: "....your recital on the night of October 23 2007 left us a deep impression...."
In colaboration with the Dutch Consulate General's Cultural and Development Programme Monique Copper gave 2 days of Masterclasses for students at the Ho Chi Minh Conservatory October 21 and 22. 12 Professional piano students of the Ho Chi Minh Conservatory of Music performed repertoire works: Chopin - a Rachmaninoff Etude, a Liszt Rhapsody, the Schumann Abegg Variations and Kinderszenen, a Chopin Scherzo, Haydn - a Mozart Sonata, Villa Lobos, Czerny, Tchaikovsky etc. All students were very attentive and fast in assimilating the suggestions. Some needed more technical advice; others needed phrasing, singing or contrasting. One Sunday was not enough and all desired another day of teaching even if this was Monday, a full school day! 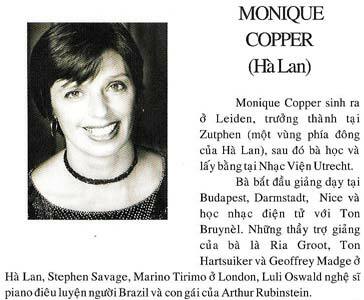 The Holland Days organised by the Dutch Consulate General in Ho Chi Minh City Monique Copper performed October 23rd her programme "Water" in the auditorium of the Ho Chi Minh City Conservatory of Music. 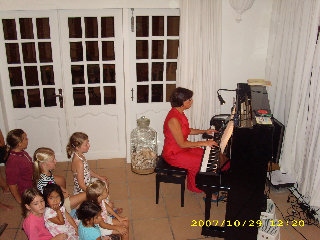 The auditorium of the Conservatory for an audience of 400 was almost completely full with mainly young listeners. Monique : "Every time during my tour I felt completely overwhelmed not only by the warm applause but also by the beautiful flower chains after each performance. And especially at the Saigon Conservatory the stage was simply a scene of an abundance of the most colourfull flowers..."
and about the masterclasses: "......Besides your knowledge you provided, our students learnt a lot from ou the spirit of hard work as well as seriousness and science in work organising. It was a wonderful recital, the extra one on October 24th with mezzo soprano Bernadette ter Heyne in the Park Hyatt Hotel Saigon. Cole Porter, Kurt Weil, Hanns Eisler & Louis Andriessen." 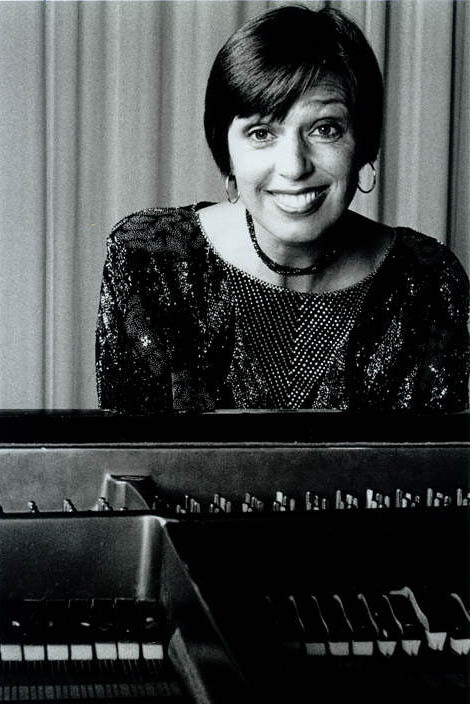 Monique Copper, piano, narration and projection. 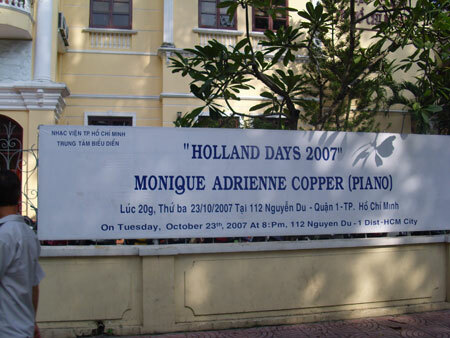 October 29th was the last appearance: a Dutch children's programme for the NTC school children (Nederlandse Taal & Cultuur) in Ho Chi Minh City. I played Poulenc's Babar with the story narrated and a projection of illustrations from the famous book of Jean de Brunhoff. And then in the end we had the wonderful Dutch experience of singing in chorus the famous Dikkertje Dap by Annie M.G. Schmidt for all the Dutch parents present! Thanks to the Dutch Consulate General Ho Chi Minh City all performances were very well organized during their Holland Days Congress.